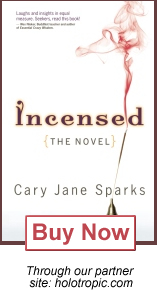 My cousin Reva called from Maine recently to tell me she’d received the copy of INCENSED I sent her. We got to talking about “the radish” in chapter 1, and I told her about the radish made from felt I found while visiting her a couple of summers ago. I loved having it around while I worked on the book, and now it has a place on my altar. Reva wanted to see the altar, so I took some pictures to send her, then decided it would be fun to write about here. The radish is right in the center of this picture. For sizing and a better view, here’s the radish on the keyboard of my MacBook Pro. I’m sorry I don’t know the name of the artist who made this. She does a lot of vegetables, also puppets. There are so many amazing craftspersons in that area – the Blue Hill Peninsula and Deer Isle. Anyway, if you’ve read INCENSED, you know why I had to have the radish. If I publish my earlier novel, THE COLIN FIRTH FILM FESTIVAL, I’ll need to get an eggplant, if there is one. Eggplant is the name of a black Lab puppy in that book. 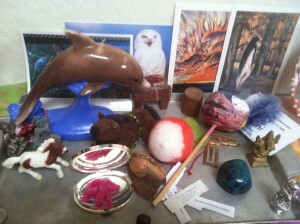 Sitting behind the radish to the left is the “tacky dolphin candle” mentioned in the INCENSED acknowledgements. That item showed up on my doorstep unexpectedly. I later found out it was compliments of my writing group; I now can’t remember why, but maybe it was after I finished the first draft. The best part is the price tag they added: $159.99. What a bargain. And speaking of dolphins (spoiler alert): If you’ve read the book, do you agree that Clickety-Whee-Whatever-His-Name-Is would make a better husband than Dirk? Comments welcome below. The third writing-related item on the altar is the mirror with the word “Author” engraved on the cover, which Wendy gave the all the group members last year. Nothing quite like an affirmation, especially in silver. Still, with that on the cover, I keep expecting to see someone else in the mirror. Jane Smiley, maybe. She’s a hero of mine. Fabulous writer AND a lover of Thoroughbred horses. The cute fuzzy guy on the left is wearing prayer beads. Behind him is a horse fetish. 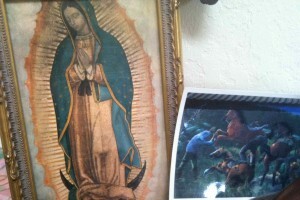 To the left, next to the Lady of Guadalupe, is a postcard my friend Vicky sent me. 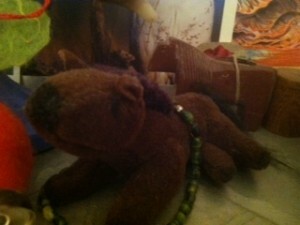 My son is not thrilled that I keep so many things he made when he was little, but they make me happy. 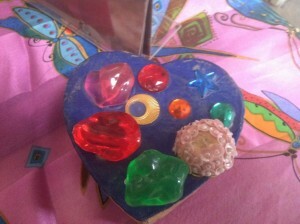 The oldest item – thus made when he was the youngest – is the heart-shaped box with the beads on it above. Do you have an altar? Send a pic! Author of Incensed: The Novel; co-director of Grof Transpersonal Training. A fan of equestrian sports; dance; music; and pop culture.